NORWAY — Karli Stanchina and Josh Plante accepted Norway High School’s most prestigious athletic honors Sunday. 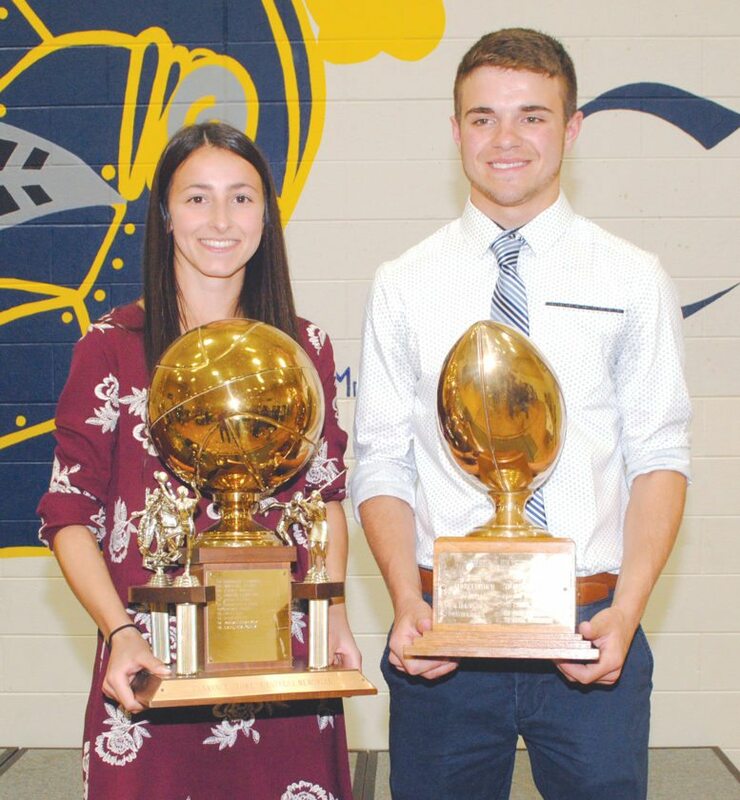 Stanchina was the recipient of the Clarence (Towe) Castelaz Trophy for the top senior girl while Plante took home the Quentin Nolte Trophy for the premier senior boy at the Norway Knights Booster Club athletic banquet. 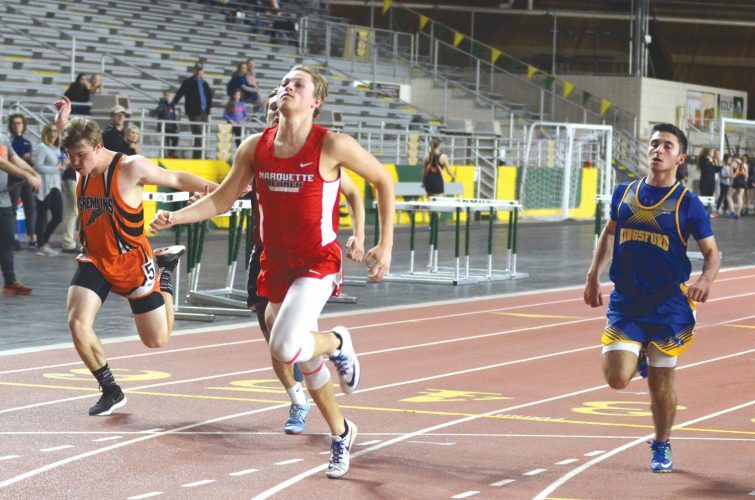 “Both awards recognize proficiency in scholastics and athletics,” said Norway High School principal and athletic director Joe Tinti. Plante also earned the football team’s most valuable player award. In major scholarship presentations, Connor Ortman received the Don Hill Memorial; Micah Wilson, Ronberg Memorial; and Kayte Casanova. Charles E. Day. Don Hill Memorial Scholarship, awarded for recognition of dedicated service, has been funded by an adult basketball tournament when money ran out a few years ago. Tinti cited the efforts of Matt (Sweets) McCarthy for directing the tournament. Leadership qualities highlight the Ronberg Scholarship. Charles E. Day Memorial Scholarship goes to the female who by her actions demonstrates the traits required of the total athlete. Payton Castelaz, Jenna Johnson and Josh Boulden joined Ortman, Stanchina and Plante in receiving Norway Knights Booster Club scholarships. Proceeds from football and basketball game 50-50 drawings fund the scholarship. Norway High School baseball coach Randy VanGasse cited the death of longtime assistant Mike Maule. Maule also coached Little League baseball for more than 30 years. NOTES: Iron Mountain-Norway co-op soccer coach Steve Hodgins described team MVP Grace Plante as a “modern day gladiator.” … Cross country coach’s choice award winner Chance Edick lowered his time by seven minutes this season … During his high school days, boys basketball coach Jeff Gallino said he played nose guard on the football team weighing 125 pounds … Coach Steve Andrews predicted volleyball is “going to be strong” at Norway in the coming years … Girls track team is down to three healthy athletes … The lengthy winter cost the baseball team 13 cancelled games while the softball team missed 16 … Norway will host MHSAA district baseball and softball tournaments. “It’s a tough district but I think we’re going to be up to the task,” said softball coach Bob Bal, who helped remove the Marion Park infield sod this past weekend.